After the Louisville Slugger Museum & Factory we went and had Father's Day dinner at Red Lobster. It is the first time we have gone to a sit down restaurant on the trip other than the little cafe in the Avenue of the Giants. Mik really enjoyed it, as he loves the cheesy biscuits and the various shrimp dishes. After dinner we went to Toys R Us. I have been trying to find time to get Mik his birthday present since the game came out earlier this month, but we have not had a convenient chance to stop until today. I got him Indiana Jones and the Staff of Kings for the PSP. He also found a $10 DS baseball game that I ended up getting him, since it goes in theme with the trip. I also bought a two disc DVD set of the Angels in the Outfield and Angels in the Infield movies. Once at the campground Mik and I watched the Angels in the Outfield movie since it is one of the few times we have electricity at the campsite. There are only a few things Mik has been excited about on the trip, such as Wrigley Field and his birthday in Pittsburgh where they have pierogis at the ballpark. Visiting the Lousiville Slugger Museum & Factory was among the few things that he actually wanted to do and was excited about. Yes, it was all because he knew he would get a free mini bat for his collection at the end of the factory tour. We got to the museum right before the 2pm tour, so we went on the tour before exploring the little museum. Dad and I went on the tour back in 2002 when I was in the National Chess Tournament in Louisville, so it was familiar, but still interesting to do again. Being a Sunday the factory was not in production mode, but they have great videos that show the production. The best part of the tour is getting to feel different models of bats from over the years and preferences and different players. They even have an area with some current players bat models to pick up and feel. They are in the process of redoing this area, so while there is a slot for a player from each MLB team not every slot has a finished bat. We picked up the Nats Adam Dunn's bat and Mariners Ken Griffy Jr.'s bat. At the end of the tour Mik and I got our free mini bats with a black logo of the museum and factory, which I will post about later in a Mik's Mini Bat Collection post. Dad got a special Most Valuable Dad 2009 mini bat, since it is Father's Day. Oh, and he actually got in free today because of it being Father's Day, so it ended up being a great day to do the Louisville Slugger Museum & Factory. After the tour ended we went through the museum part. The museum includes several old bats, such as one the Babe Ruth put knotches in for each home run he hit with it and the third bat used by DiMaggio during his 56 game hitting streak. They also have some old wood items that the company made before becoming a bat making company in 1884, such as the swinging butter churner. The final stop was at the gift shop. Mik got a personalized mini bat, which I will post about later. We were going to get him a personalized bat no matter what even if it was a big one, but since they did personalized mini bats that is what he got. I let Dad get a big one personalized as his Father's Day present. It is a two colored red one with gold lettering. 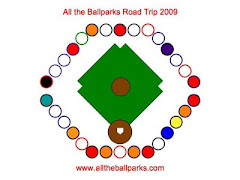 He got it personalized to say All the Ballparks 2009 Road Trip. He is going to hang it up on the ledge in the Great Room. Before heading to the car we took a bunch of photos outside the museum in front of the giant bat with us holding the personalized bats we got. Besides getting the Heritage Park baseball at Progressive Field, I also got a 2009 Interleague Play at Progressive Field commemorative baseball. The ball is silver and says 2009 Interleague Play Progressive Field on one side. On another side it lists the three Interleague match ups and the dates for them including the Brewers @ Indians, which is the Interleague match up we saw. It has also what I think is an Interleague logo of two eagles with one saying American and the other saying National. At Progressive Field Mik got a Cleveland Indians mini bat with a red handle part and a darker red top part. On the top part it says Indians and has the Indians Indian mascot logo. Wrigley Field has a penny machine with four designs right outside the gift shop that is straight ahead when you enter the park via the main entrance. Usually I get one penny and Mik gets one penny from the penny smashing machines we encounter, but being a Cubs fan I ended up getting one of every design. Mik did not want them all, but he did get two designs. One of the designs we both got was the one of Wrigley Field. This one has a picture of Wrigley and says Wrigley Field Est. 1914. The other one we both got is a Chicago Cubs logo one with the cub in the C. The other two designs I got are one with a cub holding the Cubs logo and one with crossed bats below the Cubs logo.